1. In a frying pan, fry the garlic, onion, serrano chiles, and chorizo. Add the eggs, which have been previously beaten, mix and leave to cook; add the cilantro and season to taste. Prepare the enchiladas with the tortillas and the egg. 2. Salsa: Fry the garlic, onion, chiles, and tomatillo, then add the orange juice, the chicken stock and leave to boil until it thickens. Grind up in the pan. Season to taste and pour over the enchiladas. 3. Sprinkle panela cheese and chopped onions over the top, add avocado slices and cream. 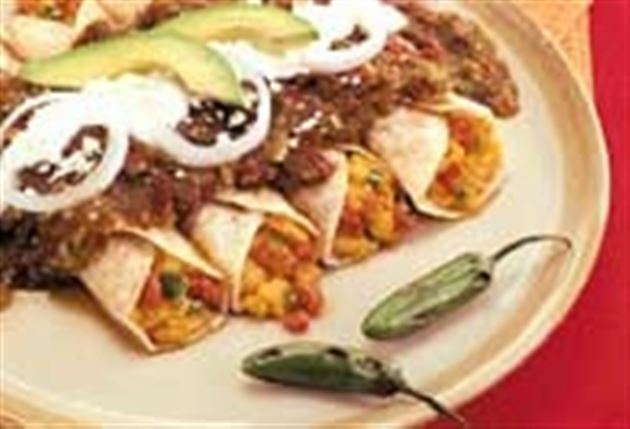 Enjoy this delicious egg and chorizo enchiladas Mexican food recipe!